Details relating to the Monaco Commemorative of 2017. The coin commemorates the 200th anniversary of the formation of the Carabinieri of Moanaco. Motif: In the inner circle are two members of the Princely Carabinieri in front of the West Façade and main gate of the Prince's Palace. The Grimaldi family has resided in the palace since 1297. At the top of the inner circle is the name of the issuing country “MONACO” written boldly. It is preceded and followed by the mint mark and the mark of the mint master. At the bottom is the inscription “CARBINIERS DU PRINCE” (Carabinieri of the Prince). Above this we see the dates 1817 and 2017. 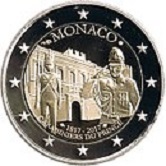 Return from Monaco Commemorative 2017 to euro coin collector.